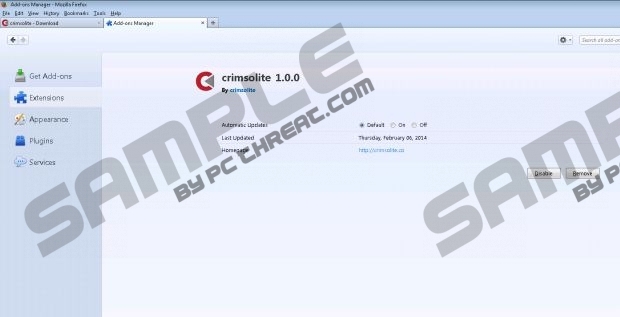 The official download page of Crimsolite is crimsolite.co; however, this is not the source that you could have used to install the application onto your Chrome, Firefox and IE browsers. As a matter of fact, it is unlikely that you have accepted the installation of the extension willingly altogether. Malware researchers have analyzed the suspicious plugin and have discovered that it could have been installed onto the aforementioned browsers alongside other software. If the program was installed silently, there is a great chance that it has been active for a long time. Crimsolite removal is strongly recommended. If Crimsolite was installed onto the PC silently, without your notice, other undesirable or even malicious programs could be running on the system as well. As malware researchers indicate, software packaging could even be used to infiltrate malware components. Overall, Crimsolite has not been designed to distribute malware. In fact, this application has been created to collect information about your virtual activity to help its developers and affiliates learn how you act online, what advertisements you are interested in and what security measures you have taken. Even if such information is not used against you, it is quite possible that unreliable parties could use it to enhance adware attacks or phishing scams. Crimsolite is very similar to Laflurla, Rinkela, Grabrez, and other browser plugins which promise you to enhance your browsing sessions. Once these applications are installed onto the browsers, they activate web cookies and other data tracking technologies to learn as much about your activity as possible. It is unlikely that any of the Crimsolite cookies could be used to collect personally identifiable information; however, cookies installed after clicking on random, corrupted advertisements could do that. Therefore, we advise that you ignore banner, pop-up and in-line advertisements. It is most essential to ignore the promoted installers because they could disguise malignant software. Do you want to keep Crimsolite running? What is the reason behind this? Do you enjoy the presented coupons? If you do, we can guarantee you that there are other browser plugins which can present even better services without enabling any risks. You can follow the manual removal guides below to get rid of the application; however, this cannot guarantee that all disturbing advertisements will be eliminated alongside. On the other hand, if you choose authentic security software (SpyHunter), all intrusive and malicious applications will be removed automatically in no time. Click Start on the Task Bar and select Control Panel. Move to Add or Remove Programs and Remove the undesirable application. Go to the Task Bar, click Start and select Control Panel. Select Uninstall a program, then right-click the one you wish to delete and select Uninstall. Right-click on the Metro UI menu, select All apps and click Control Panel. Now move to Uninstall a program and right-click the undesirable application. Click Uninstall to delete it. Quick & tested solution for Crimsolite removal.